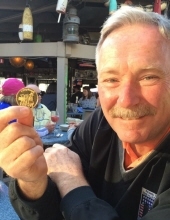 James “Jim” Peter Hall of Cherry Hill, NJ died suddenly March 31, 2019. Age 59. Beloved husband of Karen Hall (nee Benard) of Cherry Hill, NJ. Loving father of Julia Hall of Mooresville, NC; Sean Hall of Cherry Hill, NJ; and Dillon Hall of Wilmington, NC. Dear brother of Bill Hall (Barbara) of Amityville, NY; Tom Hall (Barbara) of Lindenhurst, NY and Peter Hall of Charlotte, NC. Much loved son of Elizabeth Hall (nee Gilfedder) and William Hall (pre-deceased) of Massapequa, NY. Dear uncle to Brittany, William, Ryan, Owen, and Lauren. Jim was a kind, supportive, loving, funny, hardworking husband and father. Whether it was outside working in the yard or at his job, he never stopped doing what was needed for his family and friends. He was so happy to be working out of the house, walking to Wawa each morning for his coffee and was looking forward to heading to Hilton Head, South Carolina for the RBC Heritage Golf Tournament. Words cannot express how much commitment Jim had to his children, the endless support could not be measured on any scale. Jim was very close to his brothers and their jokes and laughter each day through texts and phone calls and their numerous foursome golf rounds, and yearly trips were some of the best highlights of his life. Viewing Saturday 10:30am to 1:15pm in Holy Eucharist Church, 344 Kresson Road, Cherry Hill, NJ 08034. Mass of Christian Burial Saturday 1:30pm. Interment private. In lieu of flowers contributions in his memory may be made to The Heritage Classic Foundation, 71 Lighthouse Road, Suite 4200, Hilton Head, SC 29928, http://www.heritageclassicfoundation.com. To send flowers or a remembrance gift to the family of James "Jim" Peter Hall, please visit our Tribute Store. "Email Address" would like to share the life celebration of James "Jim" Peter Hall. Click on the "link" to go to share a favorite memory or leave a condolence message for the family.